Welcome, Pinners! Please be sure to check out my Recipe Box at the top to find more beverage recipes and homemade gift ideas! I love making this Vanilla Chai Tea Beverage because it’s a little something different. Hot, creamy, with a hint of cinnamon and vanilla, this can be mixed with hot water or milk for a delicious treat on those cold winter evenings. This makes a great gift for your girlfriends, for college students, and all the tea lovers in your life. Combine all ingredients in a food processor and blend until it is a fine powder (If you have a small food processor, you can combine just the instant tea and spices in the food processor & then combine everything together in a bowl). Add two-three tablespoons of mix to 8 ounces of hot water or milk. LOOKING FOR SUGAR-FREE CHAI TEA? My friend Christy Jordan adapted my recipe into a sugar-free version HERE. CHOCOLATE LOVER? Check out my Homemade Hot Chocolate Mix. Find more Homemade Gift Ideas on Faithful Provisions. Join the Faithful Provisions Community on Facebook for more great recipes, money-saving tips, and the Weekly Meal Plan. Coupons a mystery? Sales elude you? Fear not! Saving Savvy helps you cut food costs like a pro. I am so excited to try this! My family LOVES chai but my budget doesn’t care for it 🙂 Thank you for sharing! Kelly, I am excited about trying your recipe for this. I learned about it from Christy Jordan in a FB posting. I LOVE both of your blogs as well as your coupon matchups! I saw where you both went to Ecuador on a mission trip. How awesome and what a blessing for you and to those to whom you ministered. May God be glorified! I lived in the Seattle area for 10 years where I first learned of Chai Tea. It is a “cup of wonderful” for sure! Being from the South I never drank hot tea (only sweet ice tea) but I have become a convert. 😀 I can’t wait to try your recipe. Thank you so much for sharing! Just checked out your chia tea recipe (referred to by Christy). It sounds great and I think I have everything needed to make it. I’m not going to go light on the sugar like Christy so I’ll use your recipe (and thank Christy for giving us a choice). Now let me start perusing YOUR website; I already know Christy’s website is wonderful (as is her cookbook)! 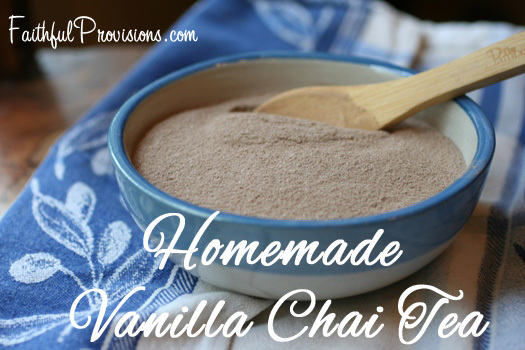 I am so excited to try your Vanilla Chai Recipe and to check out your website. I am such a fan of Christy and her recipe’s but now just as important are the stories behind them or what’s going on in her world. I thank her for introducing us to you! Wendy- I am so excited you came over and honored you came over! I absolutely adore Christy and can’t wait to have you in my Faithful Provisions community!! Carie- So nice to have you! Yes, I have an entire Recipe Box full of recipes for you. Check it out HERE. You can omit the French vanilla powdered coffee creamer and mix 2 teaspoons of vanilla extract with the sugar, let dry, blend to a powder, and mix with the other ingredients. (Use 2 cups of regular powdered creamer if you do this.) It’s easier for me than buying two kinds of creamer. Also, World Market’s spices, including ground cardamom, are very reasonably priced. I also found you on Southern Plate. I am a one person family with a non existent food budget. Can I save any money using coupons? Is it OK if I send a copy of your blog to family and friends? I love Chai and will be making this recipe. Please send me a pinterest invite, and thanks!!! Also, what do all of you prefer to use to mix with the powdered drink mix: water or milk??? I prefer milk with this and hot cocoa! Sent you the pinterest invite! I can’t wait to try this. I’ve bought the tea mix from the expensive tea stores, but like all the rest, it’s hard to justify in the budget. Thank you. Please send me a pinterest invite. Thank you. I look forward to trying some of your recipes! I’m a Pinterest holdout, but thank you so much for the recipe on Southern Plate. It’s cold here in Jersey and I need something to warm up with. I don’t have a food processor….can you use a blender?? Definitely can use a blender! Question about the unsweetened instant tea. All I could find was lemon instant tea. Do you use lemon or just unsweetened tea? You don’t want lemon in this one, it is a spicy one. Try to find unsweetened, hoping you find it! Hi Kelly, Thank you for the recipe for the Best Ever Vanilla Chai Mix. I found you on Christy Jordan’s blog. I just love her sight and now I love yours too. It is so pretty and fun. Thanks again. Lawanda, so so glad to have you here! Love Christy!! Wonderful mix! Thank you so much. Looking forward to your Pinterest invite!